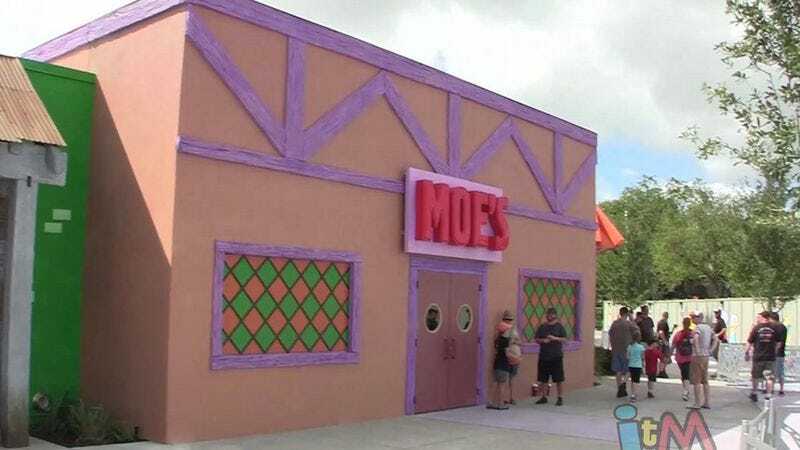 Universal Studios Orlando has finally opened the Simpsons Fast Food Boulevard, where it is absolutely possible to wash down your Heat Lamp Dog with a Duff Beer. Eateries include Cletus' Chicken Shack, whose indulgently greasy menu includes Chicken Arms, Chicken Thumbs, and a Thrilled To Be Grilled Chicken Sandwich; Krusty Burger (duh), serving up the finest Clogger Burgers and Heat Lamp Dogs; The Frying Dutchman, where you can get your Clam Chowd-arr fix; Lisa's Teahouse of Horror; and Luigi's Pizza, whose Meat-Liker's pizza promises to leave you somewhat satisfied. Patrons can enjoy these delicacies at bright red booths next to elaborate murals of Springfield. It's now also totally possible to experience a Flaming Moe (though sans-cough syrup and fire…and alcohol) while sitting next to an eerily oversized plastic Barney Gumble, who has taken up permanent residence at the bar in Moe's Tavern. Other libations include Duff Beer, Groovy Grove Juice, Mr. Teeny, and a Mt. Swartzwelder Apple Drink. Here's a six-minute video that gives an extensive tour of the food court, complete with a rocking rendition of the beloved theme song.